﻿ Is Sam Sunderland your 2017 MCN Man of the Year? 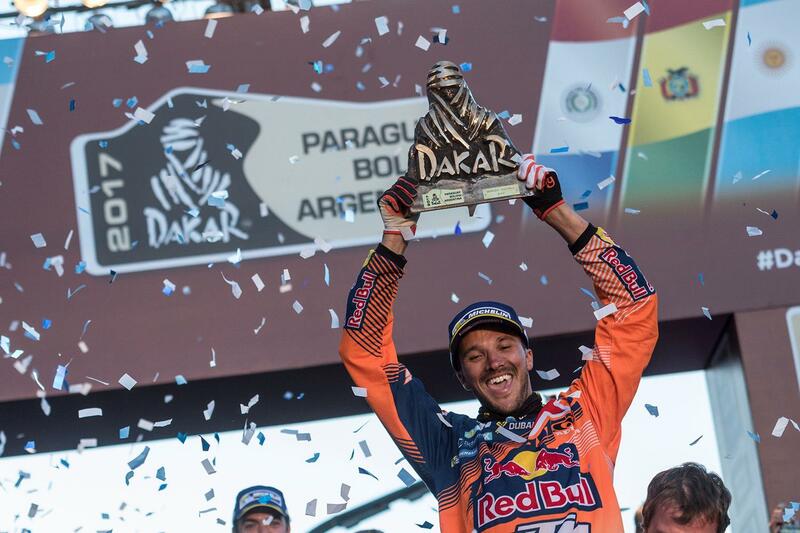 Sam Sunderland became the first British rider to win the incredibly tough Dakar Rally in 2017, with him and his Red Bull KTM squad keeping their heads in treacherous conditions while many of his opposition and their team losing theirs and suffering because of it. The 2017 Dakar Rally was far from an easy one, with torrential rain, high winds and low temperatures leaving stages cancelled and routes washed away in front of the racers’ eyes, making Sunderland’s ultra-consistent campaign even more impressive as he managed to keep his cool all the way from Asunción to Buenos Aires. It comes as the 28-year-old morphs himself into an all-round pro, matching his outright speed of the past several runnings of the race with a new consistency that meant that he was able to take the crown after three weeks’ racing. Even better, he showed that it was far from a flash in the pan all season long too, by contending for the FIM Cross Country world championship all season long as well.